My name is Lady Mya Amarise, my parents are from Azad Kashmir and I am a born and bred Londoner. I was the first Muslim Kashmiri woman to be crowned in Ms British Beauty Curve 2013/14. I have been sponsored by the USA to represent the UK as an Ambassador for women. I have competed with other models from around the world and have also been crowned Ms United Nations 2013/14. I was crowned in London as the 1st runner up for Ms Pakistan Commonwealth. Tied between myself and Nigeria, I agreed to give the crowning over to Nigeria as I had already been awarded a winner in the past. After that, I was crowned in New York, USA as Ms Asia International Woman 2015/16. I have been lucky enough to become a role model for so many ladies around the world and empower them with positivity. Our Pakistani ladies are more in need of motivation to help guide them through the right channels. Therefore, I help motivate them on all walks of life, even on how to keep their relationships watertight. I’m also an actress as well as one of the leading curvy models internationally. I have modelled in Ibiza and Madeira during a fashion show, however, the last pageant I was most recently was crowned as Ms Pakistan in was International Curve 2018/19. 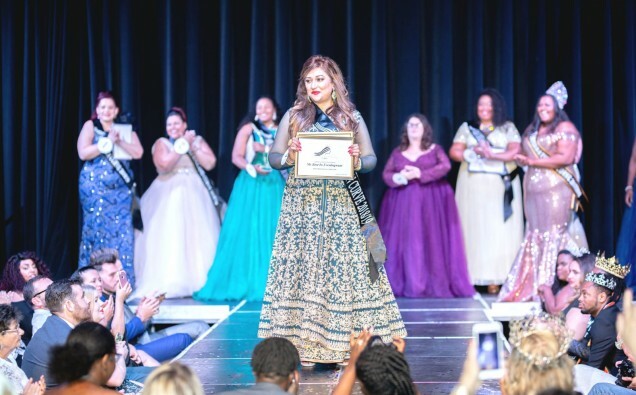 This pageant is one of the world’s largest plus sized platforms. So of course, I was very nervous to bring Pakistan on the map of pageantry because it’s the usual stereotype for a woman of my ethnicity to be a slim and small in size. However, I have proved that you can be beautiful, in any form and any size. I have managed to successfully embrace my inner beauty, and I want to encourage everyone reading this to do the same thing, by only believing in themselves first. Within my most recent pageant, I have managed to embrace my traditional Pakistani roots and bring my heritage to the stage. I had kept all three of my outfit changes traditional, keeping a dupatta on my head at all times and incorporating a designer sharara into my look. My swimwear I designed myself through the help, my personal tailor. I did an Arabic look, exposing the minimum, where I was able to take to the stage with confidence like a storm and be successfully awarded. My evening gown costume change was also from the same designer and fully sleeved. I wanted to keep my Islamic customs and tradition close, competing without exposing, and for that, I was given a standing ovation by the judges and crowd when I was crowned. From this experience, I was definitely taken by a surprise as I did not think I would have been able to return to the same platform after a five year gap. But the feedback I have received has been phenomenal. I have had full support from my family, friends, and my growing followers. I am very proud to have really showed Pakistani tradition in the most modest possible, by holding respect for myself in my own personal way. I’ve never had negative feedback from anyone, as I’ve even acted in Bollywood movies, songs and short films throughout my career. I am the first ever Pakistani woman who has competed with women from around the world, and won a title each time. However, the journey has not come without its challenges. It’s not easy to compete in swimwear categories for, as I want to uphold respect for the conservative values my parents have instilled in me from a young age. However, one of my biggest honorary achievements is being given a Beffta Award for all of my recognised hard-work. I have also been awarded in Morocco for humanity, as an Ambassador for Loani. I am now a human rights activist who works alongside many charities, and gives free dispensary for the poor, especially widows and orphaned children in underprivileged villages. As well as being a humanitarian, I also consider myself a keen business woman and entrepreneur. I hold an honorary Bachelor’s degree in Business and Management, but my journey to achieve all of my goals thus far has not been an easy one. As I was married at a young, I did so did not get a chance to complete my formal education up until recently, despite being involved in the business industry for nearly a decade. I want both men and women to look at me and see that if I can turn my life around, so can they! I’m always positive and stand firm in every decision I make. I would consider myself to be a am a self-made woman who’s a very strong minded. I believe encountering failure in your life is only a chance to better yourself and gather your strength, to remain focussed. I am blessed with a beautiful family and loved ones who push me and hold faith in me, surround yourself with positive and like-minded people, and eventually, you can achieve your dreams and aspirations too!